What a sweet surprise to find in my mail today! Happy Friday Everyone! My-oh-my this week has just flown by. And with a week like I’ve had what a nice surprise it was to open my mail and find a package just for me. So kindly sent from my sister-in-law, Cheryl. When I opened the package it was another nice surprise to find she had started her own business, Peaces by CJ. 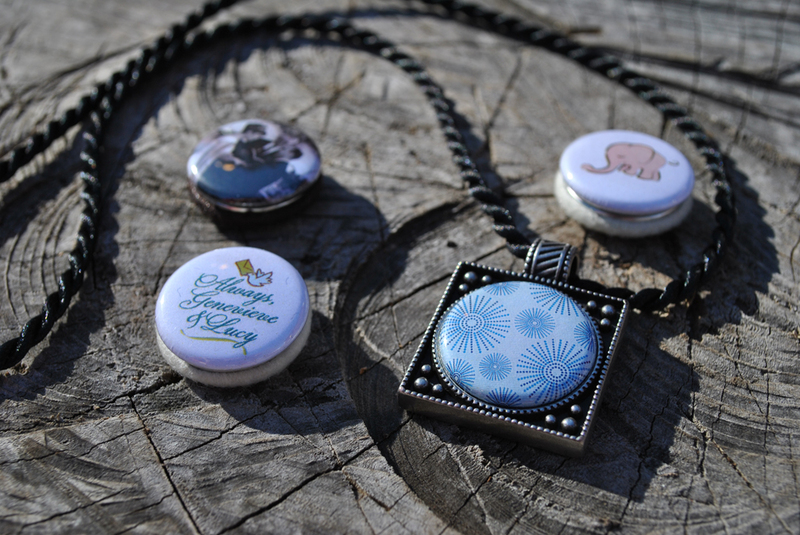 Looking inside the envelope I was thrilled to discover this beautiful necklace with interchangeable magnetic pieces. Each piece had a small element of me that I could share with the world each day. One a magnet with a photo of my wedding, one with my business logo and one of an illustration I created for my stationery designs. What a creative idea! Thank you, Cheryl! This entry was posted in Uncategorized by designgirl72. Bookmark the permalink.